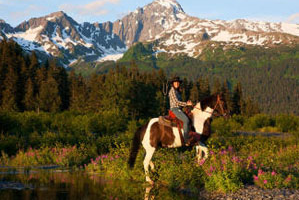 This area of Seward, Alaska is only accessible by horse back. View bald eagles up close, see where they nest and watch them feed. It is rare that you can’t ride your horse right under the trees where they majestically perch. We will ride through part of the old town of Seward that was destroyed by the great earthquake of 1964. You will hear the stories of the people who lived through it. 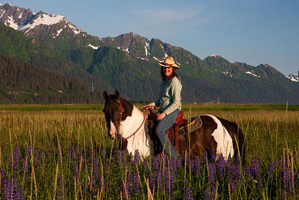 Our horses will then take us to the shore of the bay where the wildflowers meet the ocean. The bird life of this area is very diverse, active and up close. 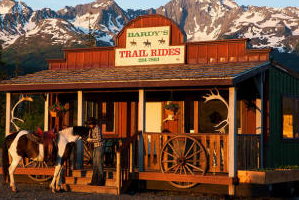 This Trail Ride could very well be the wilderness highlight of your trip to Seward and Alaska. We have two trail rides a day, beginning at 12 pm and 3 pm (check in 20 minutes early) during the months of May, June, July, and August. The cost per person is $149.00 for about a 2-hour ride ( with 3% tax comes out to $153.47), please fill out the form or give a call at (907) 362-7863.